A car struck a young woman Wednesday night in the Santa Fe Hills neighborhood, a day later people who live in the area blame the crash on the lack of stop signs, sidewalks and on speeders. KANSAS CITY, Mo. 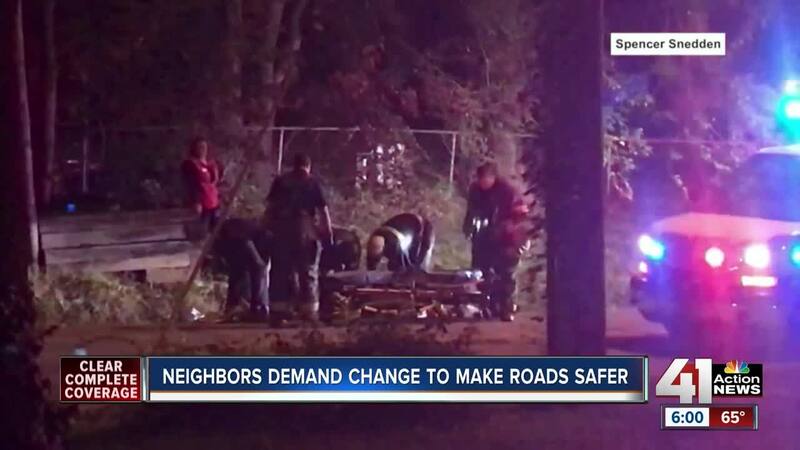 — A car struck a young woman Wednesday night in the Santa Fe Hills neighborhood, a day later people who live in the area blame the crash on the lack of stop signs, sidewalks and on speeders. The crash outside Spencer Snedden’s home near 89th and Oak. "She couldn't talk—she was groaning, screaming," Snedden said. The violent impact dented the car’s windshield. "I came out here I saw the driver—who to her credit stopped—was on the phone with the cops. The only thing I heard her say, aside from her being panicked, was 'I think she still breathing,'" Snedden said. People who live along 89th Street told 41 Action News the crash points to a larger problem between Holmes and Wornall roads. “My kids all yell at people to slow down as they’re driving through,” Mandy May-Hopson, a concerned parent said. May-Hopson doesn't let her children play in the front yard, even though there’s a sign the city posted that warns drivers that there are children in the area. “I’d say they’re going 10, 15 miles over all the time,” Kathy Pickering, another concerned resident said. The speed limit along the corridor is 30 miles per hour. Using a radar speed gun, 41 Action News caught several drivers doing at least 10 miles per hour over the limit. A KCPD spokesperson said their traffic unit hadn't worked a complaint in this area so far this year until Thursday. The lack of sidewalks is the other issue. “Sidewalks would be nice. These poor kids walking home from school, they got to walk half the time with their back to traffic,” Pickering said. “The GO KC Sidewalk program primarily repairs existing infrastructure. However, as the city moves into a systematic sidewalk inspection process, connectivity gaps will be identified where new sidewalks may be funded using up to 50% GO Bond dollars and 50% PIAC dollars. Residents can request construction of new sidewalks by filling out a PIAC request at kcmo.gov/piac ." The Santa Fe Hills Homes Association submitted a PIAC request back in August for sidewalks on 89th Street between Main Street and Troost Avenue. According to Santa Fe Hills Homes Assn. treasurer Billie Jo Gowler, the PIAC Committee will start looking at requests about November 12th, 2018. “I don’t have some kids yet. I’m planning on it. Before I do I want to make sure that I don’t want them to worry about them dying for just stepping out on the street in a nice residential area,” Snedden said.